It’s been a bank holiday weekend here in the UK so hope you have all had a good few days off of work, and spent lots of time being crafty! We are really looking forward to seeing your creations. You have until 10th June to enter and the winner will be announced on 17th June so lots of time to get your entry in. All we ask is that you follow the simple rules that can be found in the side bar. please email us at sales@polkadoodles.co.uk quoting DCW18001 to claim your prize of 3 free digis. Grab your badges from the side bar. Now let's See What the Team have made for us! Anjie - The image and the bunting are from the new Work & Play Collection 4. The image is coloured with Graph'It Markers. I made my own background with the spots and stripes by embossing the Dutch Doobadoo Diamond Mask/Stencil Art A5 onto white card. I then added the colour with the Permanent Red - Pan Pastel and the Ultramarine Blue - Pan Pastel. I then outlined the diamonds with a black pen. I also used the Dutch Doobadoo Envelope Stencil. Zoe - This challenge allowed me to use the gorgeous scene and Noah digi from Cherry Blossom collection. I used Craft Artist to place the digi image into the scene before printing it out. I then coloured the Noah image with my Graph It markers. I added the sentiment and candi to finish it off. Yvonne - Spots and Stripes or Stripes and Spots - fab challenge and this week I decided to use the fab-u-lush image of Dollie sleepyhead - she's so cool AND she has spotty slippers, ta dah! I've already hit half the brief for the challenge! This week I also used combination of markers, I used Graph'It Markers and also Copic Markers and as you'll see, Graph'Its work in excellent harmony with your other markers, so don't be put off!! The backing papers are from Enfys Digi Bundle and I used both the spotty paper and the stripe. 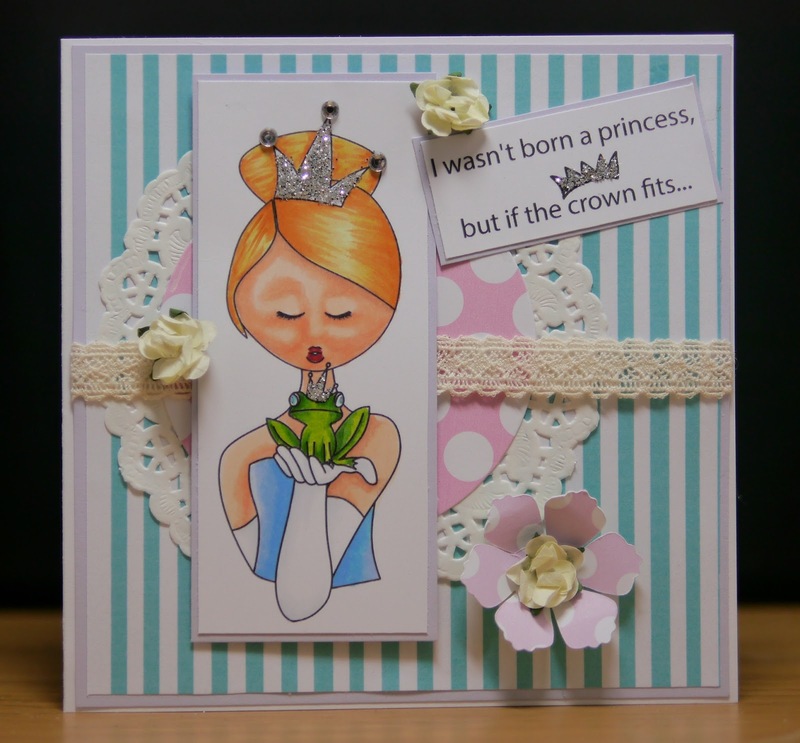 The ribbon, gems, paper flowers and die cut are from my stash. 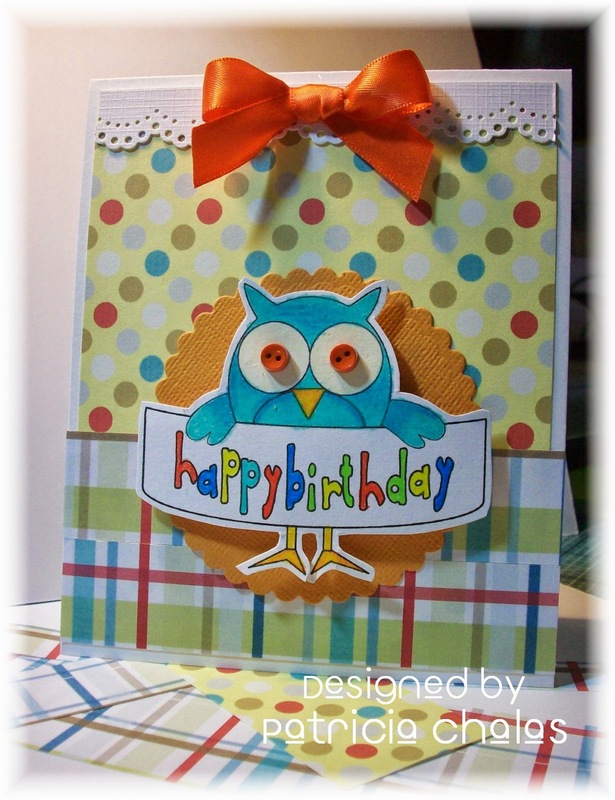 Patty's I made a cute Birthday card, for my card I use papers from the Pretty Tuff CD collection uses colourful dots and stripes, added the white border on top and use the Owl image from Sugar Birdies CD collection layered on top of a mandarin scallop CS the owl has 2 mini orange button as his eyes and as a finish touch the mini orange bow. First I dabbed the house with Maimeri Gesso ,then distressed the edges of some papers from Work And Play 1 & covered it. I also made rolled roses from the papers stuck them to the house some ribbon & a little bird made from paper clay ,then dabbed gesso here there and everywhere and hey presto my little shabby bird house. What stunning makes again this week! We hope you have all had a fabulous weekend. We've had some lovely weather here in the UK so hope you have all made the most of it. We have some fabulous new digis in the store this week so check them out! Buy Two Get One Free on all your digi purchases* (individual digistamps only) for a whole week! Remember to use the instant checkout to make it quicker! So let’s see your projects that are based on a holiday or a great day out! You have until 3rd June to enter and the winner will be announced on 10th June so lots of time to get your entry in. The random winner will receive a fab Digi bundle worth £5 and the Top 3 will receive a digi too! All we ask is that you follow the simple rules that can be found in the side bar. please email us HERE quoting DCW17001 to claim your prize of 3 free digis. Well done everyone! Grab your badges from the side bar. Now let's See the fabulous creations the team have made for us! Zoe - Well this challenge allowed me once again to tick off a task on my to-do-list!! I have a small journal/Smash book that I have started to fill with photos and memories from days out and holidays. 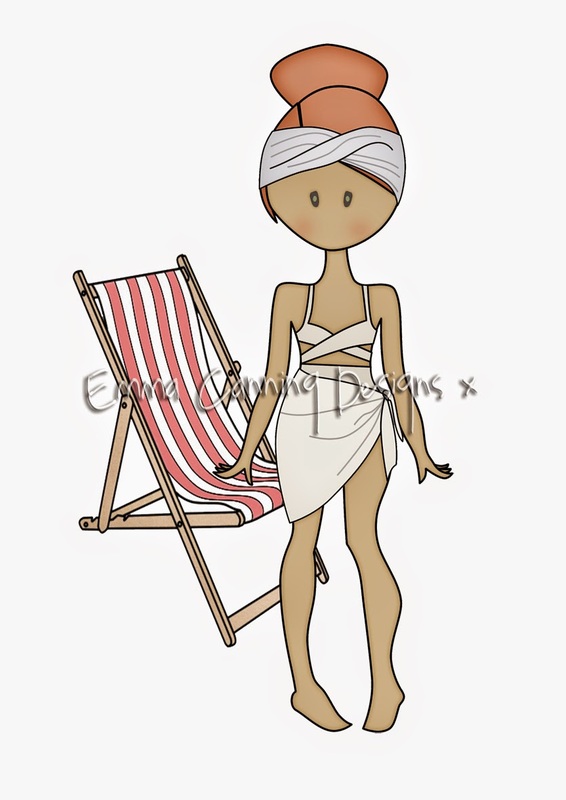 So I found used this girl digi from Candy Doodles to use as we often spend time out just chilling! I covered the front with strips of washi tape and ribbon before adding the image, embellies and charms. Susan...I have used the amazing new collection Work and Play 4 available on CD only at the moment,but will be in the Digi download shop very soon, just thought I would give you a sneaky look at what's to come...For my interpretation of the theme I have chosen the Tour de France, and up here in North Yorkshire the Tour De France is about to start and you will find Yellow Bikes all over the place LOL! 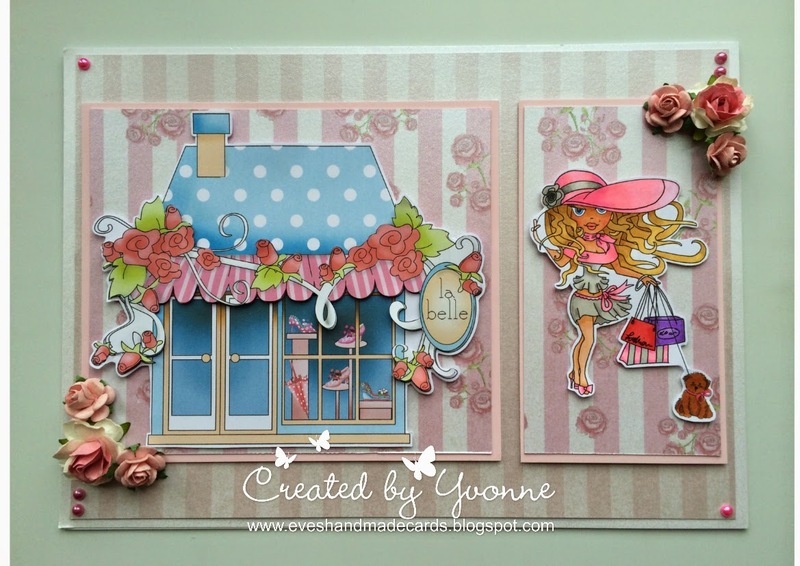 Yvonne - This was a fun challenge because I knew EXACTLY what I wanted to use, a fun day out means - shopping!! 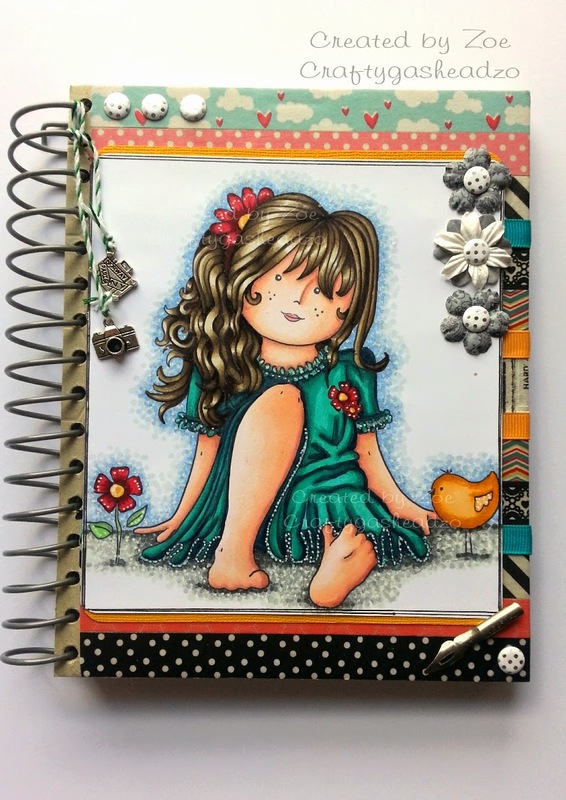 I used an image 'Shopping With Itsy' from Dollie Daydream Girl Talk Collection - which you can get as a CD-Rom, a digi download for the whole collection, or just the image as a digi download or from the Etsy shop......so basically, you have no reason to say you couldn't find it! LOL!! 'Shopping with Itsy' is coloured with my Graph'It Markers. The shop is an embellishment from the Collection, I printed two, in order to decoupage the rose bunting. 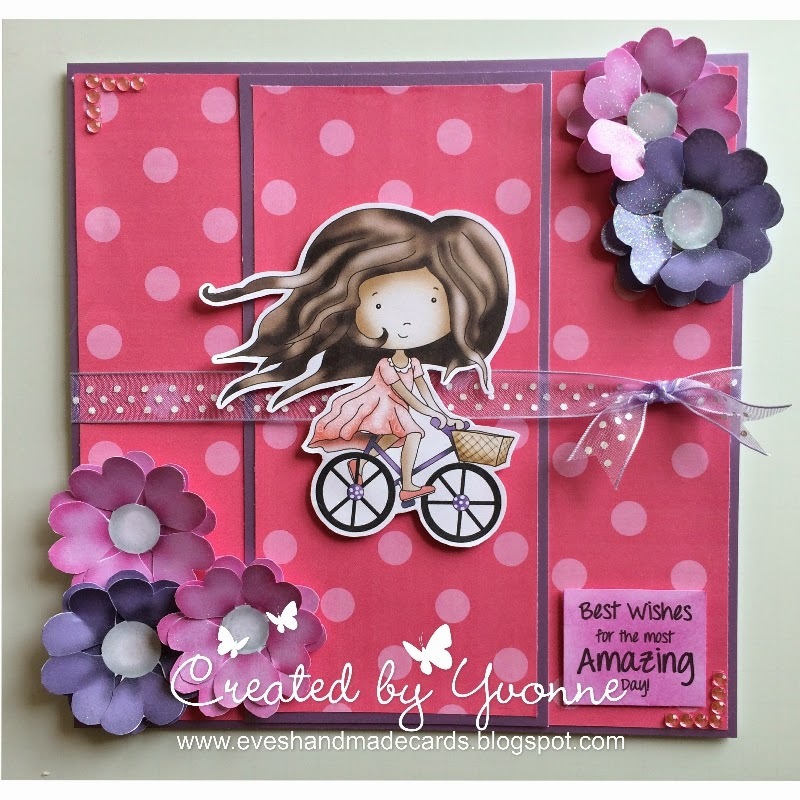 I made an A4 landscape card and used a backing paper from the Nikky bundle available on the digiworld download store, I also used a backing paper from the Roses Bundle. The backing papers I printed onto centura pearl card and the paper flowers & pearls are from my stash. Patty - This was a real challenge to me, I wasn't sure what to use and what kind of card to make...so started looking through my digis and came across this little boy from the Pretty Tuff collection which reminds me of my son...so I decide to make him a cute card just to remind him of enjoy his age to the fullest. 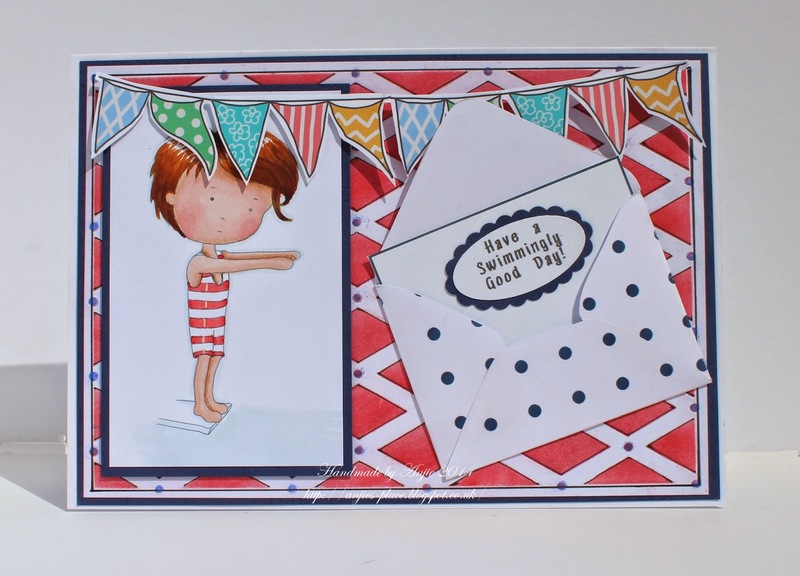 Also the papers are from the same collection and mix the Stars with the stripes, added the small banner on top and the small brown bow and the sentiment is from the Stamp Doodles set. 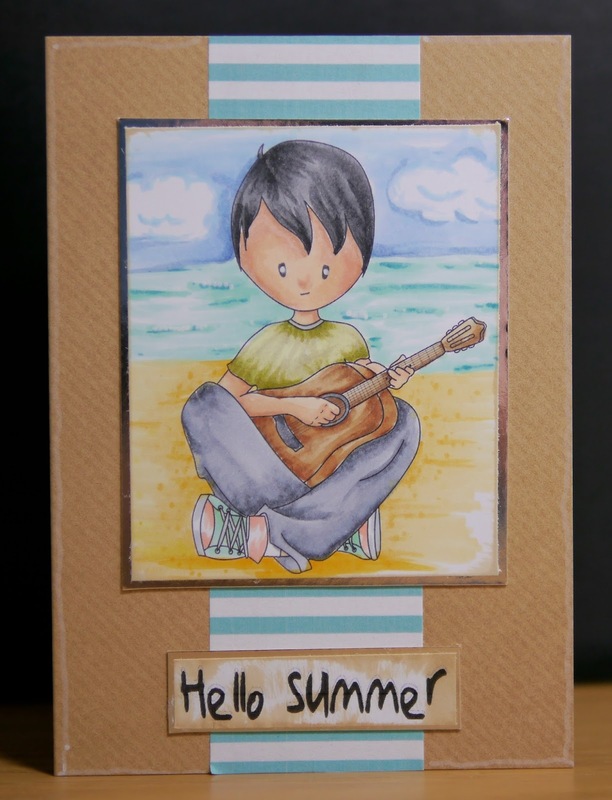 Jo- I wasn't sure what kind of card to make for this weeks theme and I was looking through my digi stash and came across this cool Emma Canning guitar boy digi. So I thought I would work him into a beach scene with a cool summer vibe, ideal for teens with summer birthdays. I was aiming for a tie-dye look with the t-shirt, not sure if it has worked but it looks interesting. 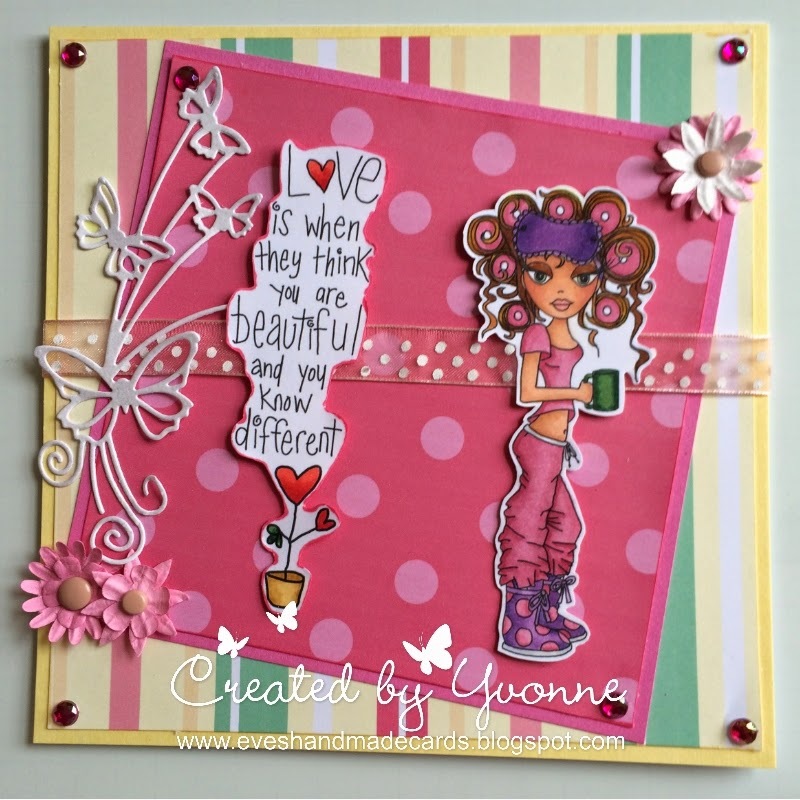 The paper is from the Dollie Daydream collection available here. Great projects as ever! See you next time!! Wk 19 Digi Choosday Craft Challenge – Embellish it! in the store until Thursday midnight! Before we get onto the challenge we have to announce the winner from the week 15 challenge, use 2 papers. The winner was #12 Mandz please email us here quoting DCW15001 to claim your prize of 3 free digis. Well done everyone. Grab your badges from the side bar. You have until 27th May at noon GMT to enter and the winner will be announced on 3rd June so lots of time to get your entry in. All we ask is that you follow the simple rules that can be found in the side bar. 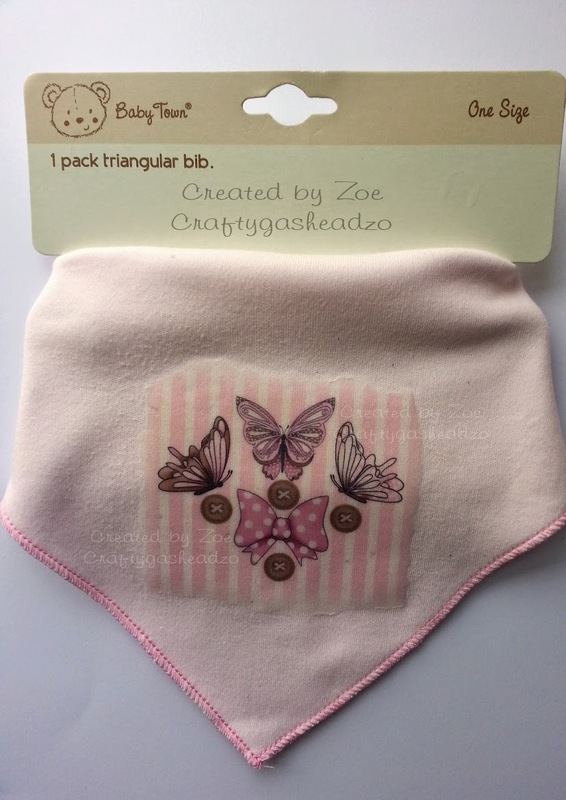 Zoe - I decided to finally do something I've wanted to do for ages and that is to decorate/embellish this bib. 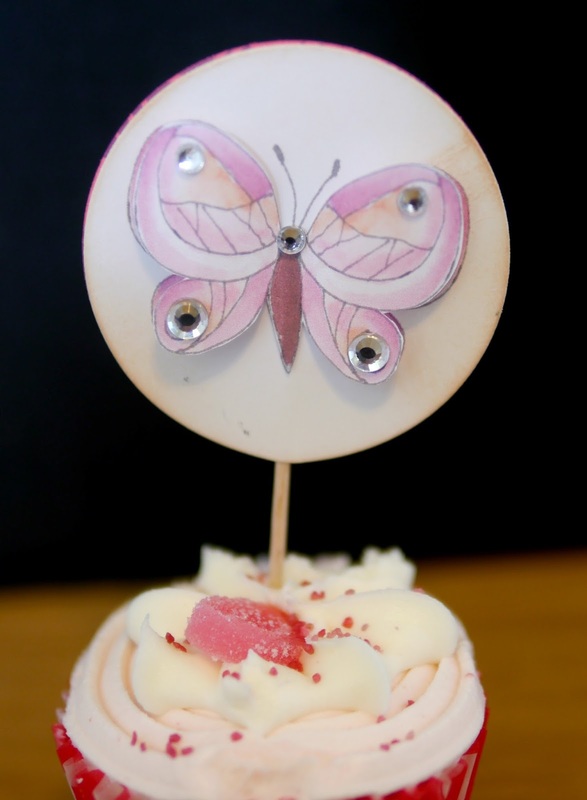 I took a number of digi images from the Bonbon Belles collection into Craft Artist and created the topper. I then printed it onto fabric transfer paper. Following the instructions I ironed it onto this bib. Am really pleased with it. May try printing a black/white image and colouring with my markers next! Anjie - I've used the adorable Angel Digital Stamp by Emma Canning and coloured it with Graph'It Markers. 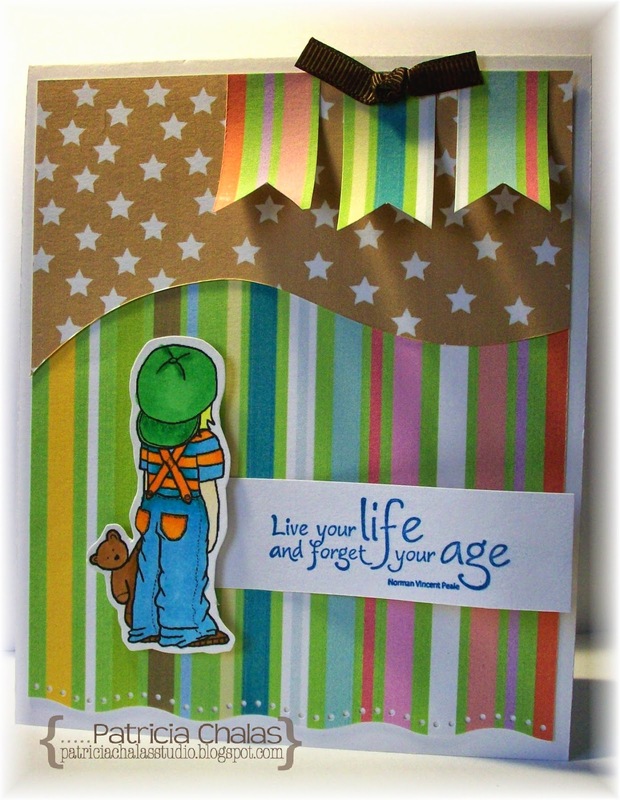 The papers is a freebie from the recent blog hop over at Polkadoodles to celebrate their 5th birthday. I've chosen to use flowers from the Work & Play Collection 2 CD and a butterfly from the Studio 12 CD-rom Picknix Collection 1. I've also used ribbon and a button from my stash. Susan : For my card this week I have used Papers from Girls Hoot I just love the bright papers in this collection and for my digi I have chosen an image from Dollie Daydreams goes East and coloured her with my Graph'it markers list I have used can be found on my blog, The dies are by Tattered Lace and the embellishment's are from my Stash. 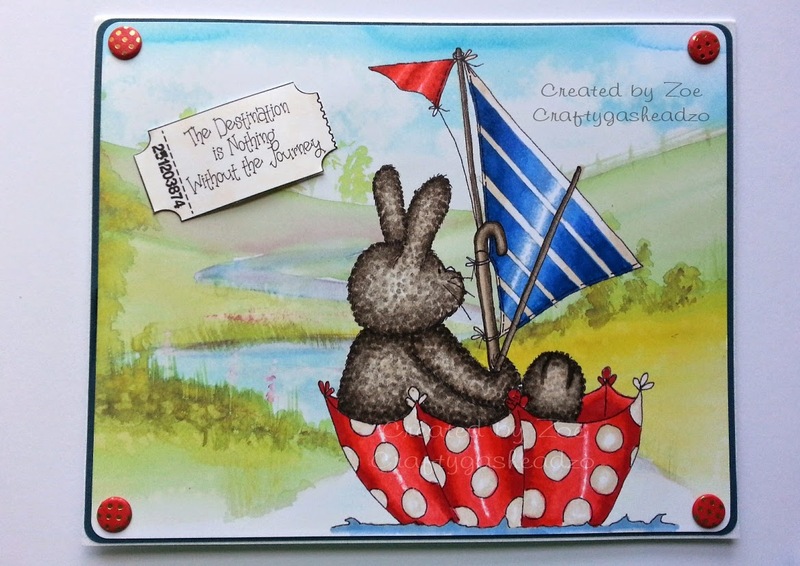 Yvonne - For my card this week, I decided to put together a card made of pre-coloured digistamps. I'm sure I am not alone in suddenly remembering you were supposed to make a card for the next day - and although we love our colouring of black and white digi stamps, it's also a great relief to have the coloured digi's to hand too! I have taken this image from the new Work & Play Collection 4. I used one of the papers that came with the digi bundle of Enfys, the flowers are from the digi bundle Back to Nature which I then added a bit of sparkle too; the sentiment is from Dollie Daydream Goes East which you can get as a CD-Rom or digi download. The cardstock and ribbon are from my stash. Jo- I have coloured in Poppy from the Bon Bon Belles cd-rom and made her the focus of this week's card, she's too sweet not to really ;) I made my own flowers to embellish her using my cameo and some oversized gems for the centres, and added glitter to the edges of my topper and a bit to the image for some subtle sparkle. Patty - I made a Best Wishes card using papers from Pretty Sweet - Mini CD collection rosebud paper and the Amelia Digi, combined them with some pink and gingham papers from Cherryblossom Lane CD collection which I die cut to make the 3 colored flower, I colored Amelia using copics makers and to embellish it use some yellow button and a pink bow. Fantastic inspiration again this week! Don't forget you have until 27th May to enter and the winner will be announced on 3rd June so lots of time to get your entry in. All we ask is that you follow the simple rules that can be found in the side bar. Wk 18 Digi Choosday Craft Challenge - Make it for the Kids! We hope you all had a great bank holiday weekend and have been creating lots of fab cards and projects which will fit this week's challenge! you need to work a little to get them though! We have a mini blog hop going on over at Polkadoodles so if you hop along with us you can grab 5 - YES, 5!!! Digibundles completely free and also join in for an absolute TON of free candy along the way too! We also have a quick heads up for you - you can catch Nikky on Create and Craft TV this week - tune in on Thursday at noon for another great colouring show with Graph'It, but you can also join her on Friday too with a Polkadoodles show at 8am and more shows at 9am, 1pm and 7pm! Make sure you tune in for some lovely demos along the way! The design team were asked to specifically make something for a party but it's up to you what you enter! You have until Tues 20th May at noon to enter and the random winner will receive £5 of downloads. You can see last time's winners at the bottom of this post. Let's See What the Team have made for us! Yvonne - Hello there!! Well this week I had a complete blast! 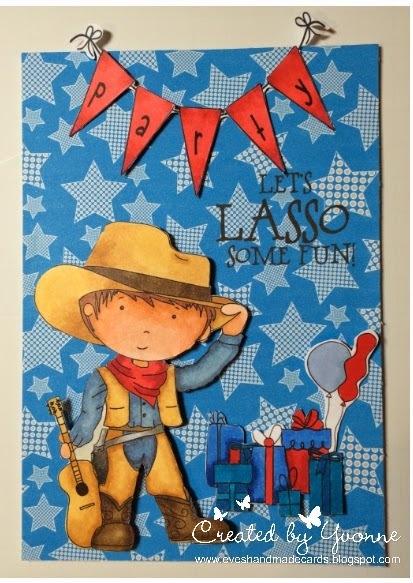 Make something for a kids party; well it has to be the invites, and what better little character to use for birthday invites than Cowboy off of Work and Play Collection 3 which is now available to download through Polkadoodles Digiworld Downloadables or as a CD-Rom. I adore him and he comes with his own fab papers too, one of which is what I used for the backing paper. Cowboy also has his own sentiments and I took the sentiment into craft artist along with the paper and printed them out as one. I also used embellishments from Digistamp Heaven CD-Rom, for the gifts and bunting (there has to be bunting on invites, it's the law). 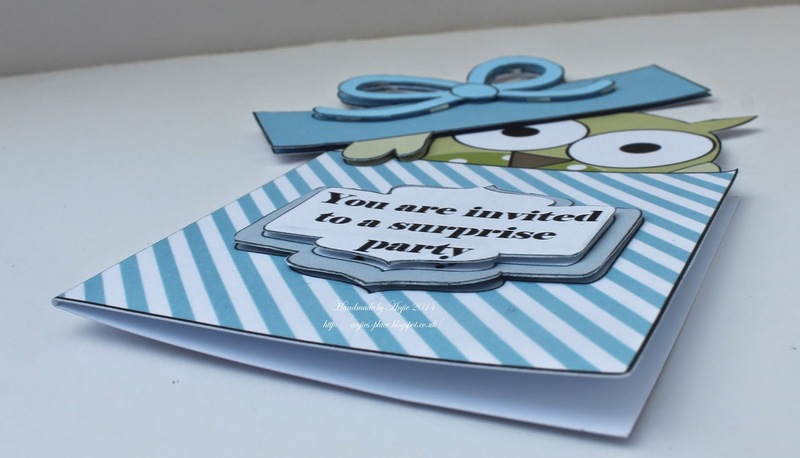 All coloured with my Graph'It Markers which are simply fabulous and there you have a nice wee A6 Birthday Invite! Yee-hah! Susan This week I have used a little bit of something old and new to celebrate Polkadoodles 5th Birthday. The papers and the cute little owls are from the CD Sugar Birdies or as Digi Set ,and the Drummer Boy is from the CD Work and Play 1 also available as a download. Zoe - So this week I used 2 digi's from the Bonbon Belles collection. 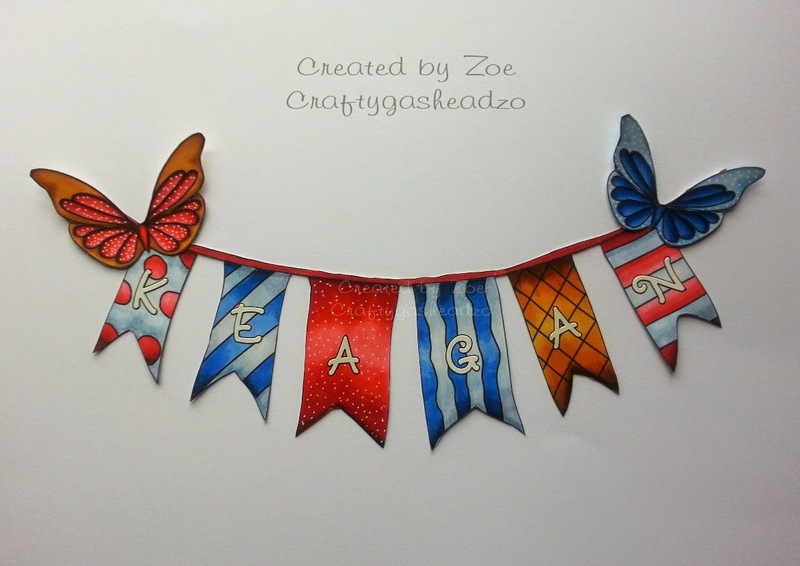 I used the banner and a butterfly to create this name banner. I coloured them both using my Graph It markers and also added the silver glitter shake pens to bring out details. Perfect for any party!! Sally - This week I have chose 4 digis from the Bonbon Belles Collection. I used one of the toppers with the Pirate Ship, the Pirate, treasure chest and the rocks. I then made a stepper card. I matted the main image with some plain cardstock and the steps with the same colour. 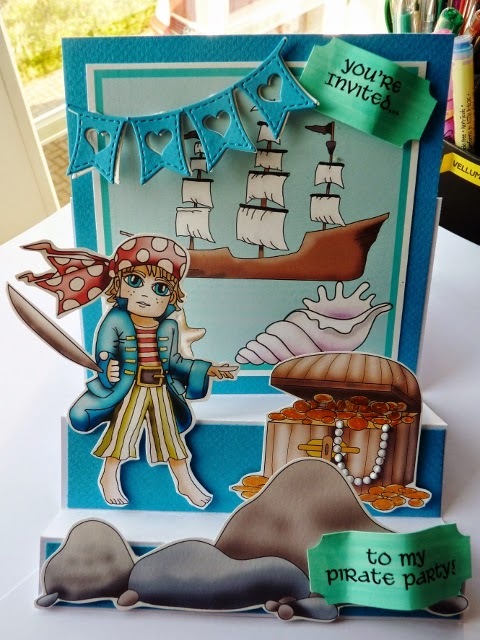 I then cut out the Pirate, treasure chest and rocks and adhered them to the card. I die cut some bunting and made some ticket sentiments. I added gold glitter pen to the gold treasure and some liquid pearls to the pearls. Jo- Something that can be a bit off putting about making party decorations and favours is having to make lots and lots of the same thing, but digi images makes it easier to bulk make unique decorations. I have used just one element from the flowers and leaves digi bundle and just diecut and decoupaged and added gems for a pretty party cupcake topper, you could add children's names to the back for a personalised touch. 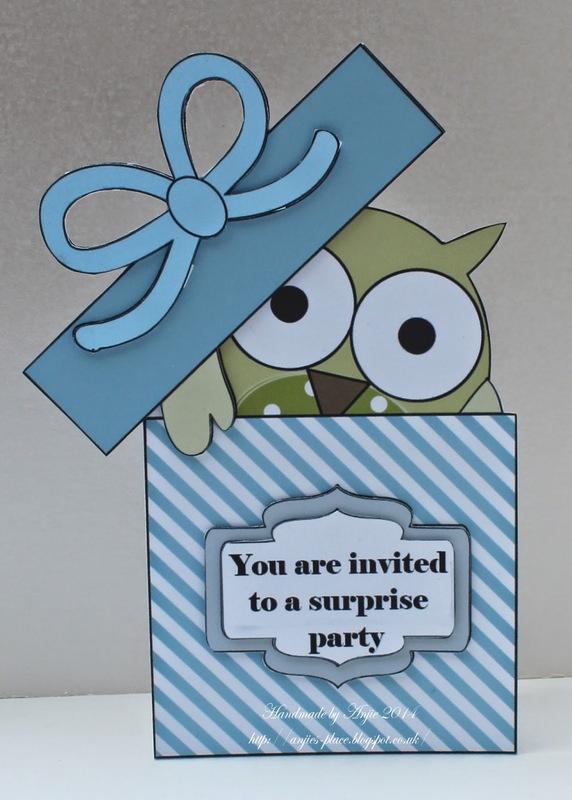 Anjie - I have used the Boys Hoot Download Bundle to create this invite, I thought the owl peeking out of the box was perfect for a surprise party. I took the topper into a graphic program (MCS) to make the sentiment. I have layered up the lid and bow on the box and the sentiment using 3D foam. What great inspiration again this week! No 7 Katie Tate - well done Katie! We look forward to seeing your entries! See you next time!